As a microscopic software for pedestrian and crowd simulation, PTV Viswalk is particularly well-suited for urban and construction planning, pedestrian safety planning, evacuation measures, integrated transport planning, and numerous other applications aimed at ensuring a smooth flow of pedestrians. 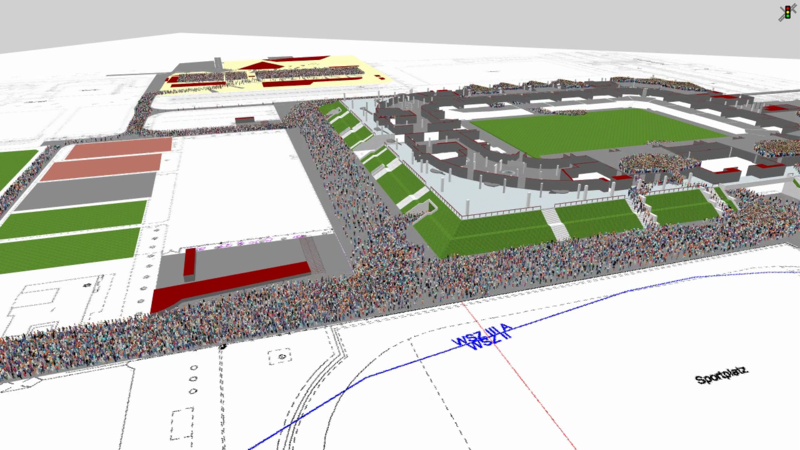 Using crowd simulation, you can analyse capacity and use space efficiently. PTV Viswalk helps you to avoid bottlenecks and remove possible spatial barriers when planning new buildings and assessing the current condition of existing space. Moreover, the software allows you to compare costs and efforts for alternative planning. PTV Viswalk ensures you make maximum use of available floor or space when designing large buildings. Crowd safety is of paramount concern, especially in public places. PTV Viswalk assists you in taking numerous structural and organisational measures aimed to reduce and control the unmanageable behaviour of people in emergency situations. Crowd simulation can also be used to manage the day to day operations in high traffic locations such as railway stations or airports. It is a highly demanding task, which is why PTV Viswalk can support the management by using our state-of-the-art data analysis and planning of crowd dynamics. To get an idea on how PTV Viswalk works, check out some of our references.